"Love... It's the beauty in what you see." I'm a love story photographer. I love everything about love. I believe in simplicity, soulfulness and emotion in my work. It blesses my heart to capture the special moments, and the sweetest things of my clients and friends. I believe that your wedding is the greatest love story to ever be told, and I am passionate about telling that story through the art of photography. I'm based in Atlanta, GA but shoot joy-filled weddings wherever they take me! I'm a firm believer in love never fails. Every image tells a story. My goal is not only to shoot what the image looks like, but to shoot what it feels like. "What I love most about photography is that it leaves a proof, even if for a heartbeat, that everything was perfect." "A butterfly doesn't know the color of their wings, but others know how truly beautiful it is." I find beauty in everything. Little fingers, toes, and smiles are my favorite. Capturing the love and sweetness of precious moments gives my heart joy like no other. 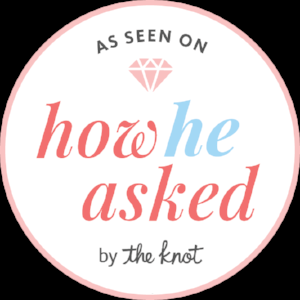 It's such an honor to be featured on the knot's, How He asked! click to link to see Jennifer and Donald's Engagement Session! Excited to be one of Two bright lights most published members!